Welcome to Blue Wolf Charters where your experienced and professional fishing guide, Roy Carver, will take you on a marine adventure from beautiful Victoria, BC and beyond. You will experience magnificent scenery and wildlife while you fish in comfort aboard the new 'Blue Wolf' for 2011, a 26-foot Hourston Glasscraft Sportfisher that Roy has personally customized for your fishing needs. 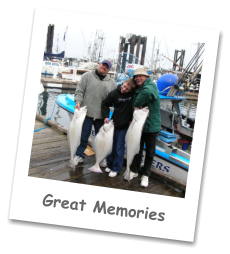 In the spring, you can fish for the ever-popular Pacific Halibut that ranges in size from 20 lb 'chickens' to 200 lb 'barn doors'! Roy will set the gear for you at his favourite 'honey holes' off the Victoria waterfront such as Constance, Border & Coyote Banks, and the nearby waters of Oak Bay. Watch our new Videos showing Blue Wolf in action and including Underwater Salmon Footage and Roy Carver Filleting A Client's Catch. In the summer, everyone's attention shifts to the West Coast's world-renowned salmon fishing and the search for the ultimate prize… a Tyee Salmon (over 30 lbs)! 'Blue Wolf' will take you on the waters between Sooke to Port Renfrew to catch Chinook ('King') Salmon on their migratory run through the Strait of Juan de Fuca. You might also intercept schools of other popular varieties of Pacific Salmon such as Sockeye, Coho ('Silver'), Pink and Chum. 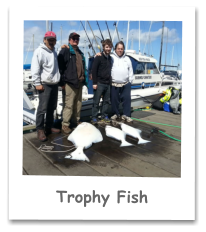 Roy's experience and local knowledge will give you the 'edge' as you fish local 'hot spots' such as Beechey Head, Trap Shack, Secretary Island, Otter Point, Muir Creek and Sheringham Point. Roy’s favorite Salmon, Halibut, Prawn, and Crab recipes. All anglers must obtain a Tidal Water Sport Fishing License with Salmon Stamp before boarding the Blue Wolf. Licenses are not for sale aboard the boat and must be purchased before your charter from Fisheries and Oceans Canada. View underwater video of a salmon being caught.